The Oriental 188 Shopping Centre is a shopping centre in Wan Chai that sells all different kinds of electronic devices, video games, movies, computers, collectibles and other goodies. If you’re interested in buying any of these kind of items, it’s best to get it here because most of the time you’ll find it cheaper here than anywhere else. The Oriental 188 Shopping Centre, or “188” for short (pronounced “yuht baht baht” in Cantonese) spans 3 levels with tons of gaming and electronics shops crammed into a fairly small area. This mall is very popular with young people and can get very crowded at times. You’ll notice there’s limited walking space in the hallways between shops. So make sure to keep an eye on all your belongings at all times as it’s very easy for thieves to steal your belongings in a small and crowded area. Inside you’ll find all the newest video games, consoles and accessories from all over the world. Some video games are made specifically for Japan, Europe, North America, or Asia and won’t work on any video game system except for one built for that specific region of the world. For example, if you buy a Japanese video game, it may only work on a Japanese video game system and not the one you have at home. This happens when a video game console or game has a “region lock” put on it. This region lock prevents a video game console from a specific part of the world to play games made in different parts of the world. You’ll want to check with the vendors to make sure that the video game you intend to buy will work on your console at home. Video game consoles that don’t have a region lock on them include the Playstation 3, Playstation Vita, PSP, and the Nintendo DS. You can play any game from around the world on these consoles with no problems at all. Video game consoles with region locks include the XBOX 360, Nintendo Wii, DSi and 3DS. Games from other parts of the world won’t work on these systems unless the game and console were built for the same region. There are a few exceptions though. For example some 3DS games don’t have region locks on them and will work on any system, while other 3DS games have strict region locks. It all depends on what the game developer wanted to do with their game. I recommend doing a bit of research before you buy any video games at the Oriental 188 Shopping Centre. If you want to play games from Hong Kong on your Nintendo Wii, you can Unlock Your Wii. Unlocking your Wii will allow you to play import games from other parts of the world. In this mall you can find all sorts of Asian movies, Japanese anime, and popular North American movies. You’ll probably find these movies to be cheaper than at other stores. Something to keep in mind is that some movies have region locks on them just like video games. So make sure to find out if the movies you buy from Hong Kong will work when you get home. An easy way to get around this is to buy a region free DVD or Blu Ray player. These will play any movie from anywhere in the world, regardless of region locks. Inside the Oriental 188 Shopping Centre you’ll also find stores selling collectible figures, cell phone straps, and other toys. It’s a great place to buy figures of your favourite characters from games, movies, TV shows and anime (most toys available here are popular Japanese and Asian characters). You can find whole sets of toys for sale in 1 package, saving you the time and effort of finding every character in the set individually. Another reason to make a trip to the Oriental 188 Shopping Centre would be to find an extra battery for an electronic device such as a cell phone or camera. There are lots of stores here selling batteries for any brand of electronic device you may have. It’s a good idea to have a back up battery in case one dies at the most important moment. And while you’re there, you could also pick up an extra memory card if you need one. You can find computers and all kinds of accessories for a computer here as well. If you can’t find what you’re looking for, visit a Hong Kong Computer Centre. The 298 Computer Zone is right behind this mall and is the perfect place to shop for computers & computer parts. Make sure the computer you buy is in a language you understand. If you’re at the Oriental 188 Shopping Centre for a long time and you start to get hungry, you can find small food shops that sell all sorts of Hong Kong style food, drinks and snacks. There probably won’t be a spot to sit and eat your food because of the limited space in the shopping centre. This mall is a lot smaller than the malls in Hong Kong that sell brand name products. The hallways are very narrow, and a lot of stores are crammed into a small area. Keep an eye on your belongings at all times when walking through crowds of people. You don’t want to lose something important. Items sold in Oriental 188 Shopping Centre are usually cheaper than in bigger electronics stores in Hong Kong, such as Broadway and Fortress. You can also try bargaining with the shop owners. Something to be aware of is that items sold here don’t come with a warranty. Some shops may only accept cash. I recommend shopping around a little bit before purchasing anything from a shop inside this mall. Sometimes you can find the same game or electronic device for a little bit cheaper at a different store in the mall. Sometimes stores near the entrance sell their products for more than the stores further into the store. The Oriental 188 Shopping Centre is one of my favourite places to go shopping in Hong Kong. There are so many things to see in this crowded mall that when I went here I ended up spending half a day shopping. I purchased a PSP, an extra battery for my camera, some collectible toys, and some Japanese games at 188 that weren’t available in North America at the time. I was able to play these video games months before they came to North America. Sometimes certain games won’t even come out where you live and importing is the only way you can play that game. This makes a shopping centre like 188 a very interesting place to go if you’re in Hong Kong. And the lower prices helped make this place more appealing as well. 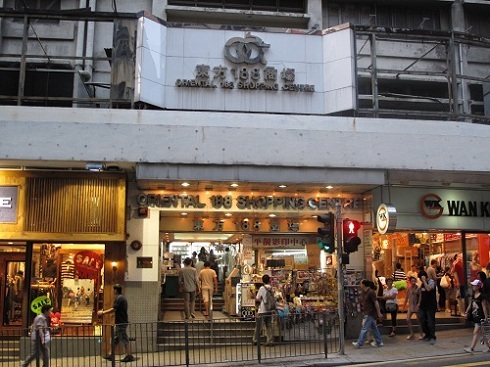 Oriental 188 Shopping Centre is found in the Wan Chai District of Hong Kong Island. There isn’t really an easy way to get to the mall because all MTR stations are quite far away from the mall. You can take the MTR to Wan Chai MTR station and walk down Hennessey Road until you reach the mall. It will take a lot of walking to get there though. The best way to get to the Oriental 188 Shopping Centre is by bus. Look for a bus route that stops at either 298 Hennessey Road (at Kwong Sang Hong Building) or Wan Chai Road and Heard Street. Another option is to take the Tram to the C C Wu Building stop, walk through the C C Wu Building and turn right once you get outside.